Hiya guys! I hope everyone is ready for another day of more gorgeous shades. I almost feel like I should just constantly wear a shirt or hat that says 'polish enabler' or something, haha. Today I'm sharing swatches for the Music City Collection by Smokey Mountain Lacquers. This is a six piece collection filled with shimmer and holo goodness. Let's get to the swatches! The Music City Collection by Smokey Mountain Lacquers will be releasing Sunday, September 18th at 8pm EST. Each full-size bottle retails between $8.49-$9.99 and mini-size bottles retail for $6. You can also purchase the full-size complete set for $49.90 or in a mini set for $32.40. Ring of Fire can be described as a deep brick red cream with gold shimmer. Starting off with one of my favorites in this collection. Not only is it a beauty for the Fall, but it feels like such a unique shimmer in my collection. Definitely one of my two must-have picks. The formula has good consistency, not too thick or too thin. 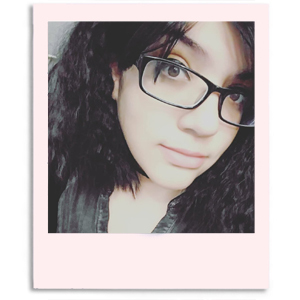 It applies really smooth and has a good opacity as well. Shown here in two coats and sealed with a glossy topcoat. Hello World can be described as a olive green linear holo with aqua shimmer. You ever have a love/hate relationship with a polish? That's been me with this one right here. Although the end result looks gorgeous and so shimmery (the aqua compliments the green hue so perfectly) it was a bit of work to get there. The formula has a jelly application and was much more sheer than the others. So much so that even after three coats I still felt like I could see my nail line. Shown here in three coats and sealed with a glossy topcoat. 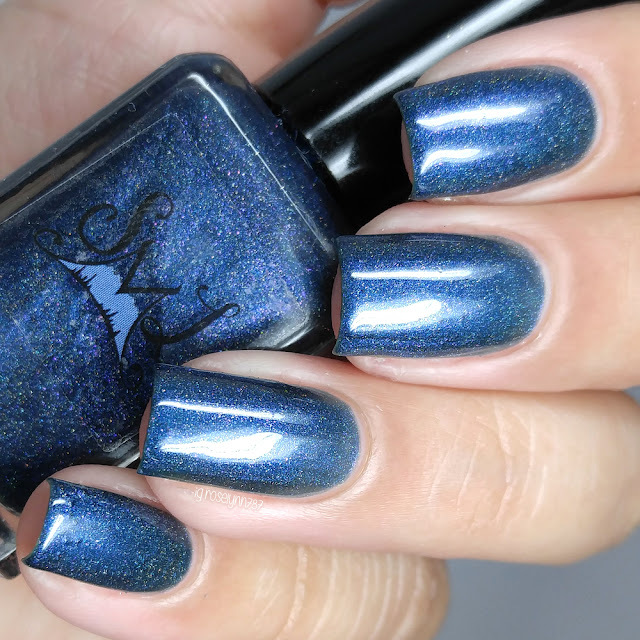 Why Not Me can be described as a deep blue linear holo with purple shimmer. As you may know by now blue is a favorite color of mine to wear, so of course this is another must-have pick for me. The formula and application is similar to that of Ring of Fire. Very smooth with opacity. And despite it's pigmentation I didn't experience any staining to my nails after a few days of wear-time. Shown here in two coats and sealed with a glossy topcoat. 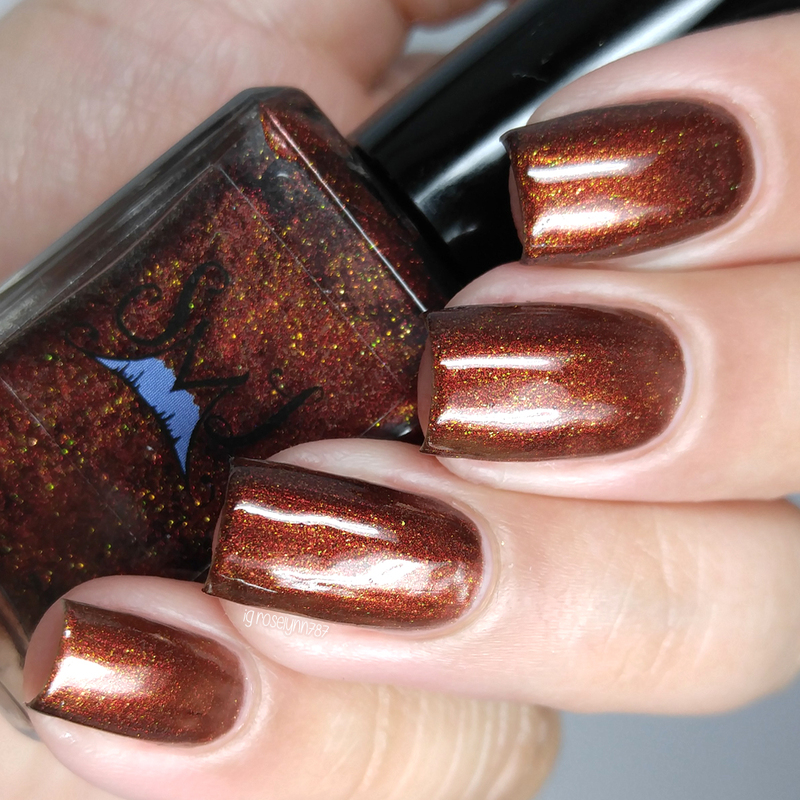 9 to 5 can be described as a caramel brown cream with gold shimmer. Definitely not a shade I was expecting to like. Once I wore it though I couldn't resist how dainty and regal it looked. The formula had a bit of a thicker consistency compared to the rest in this collection. Although it's manageable it's best not to use a light-hand and minimize the need to layer on too many coats. Shown here in two coats and sealed with a glossy topcoat. Wildest Dreams can be described as a deep purple linear holo with pink shimmer and blue micro flakies. Who doesn't love a good sparkly purple?! The shimmer definitely brings more life into this shade as it blends with the subtle holo effect. The formula has a jelly kind of application and a good consistency. Great self-leveling as well, which made layering a breeze. Shown here in two coats and sealed with a glossy topcoat. Wrecking Ball can be described as a black cream with multi-color shimmer. 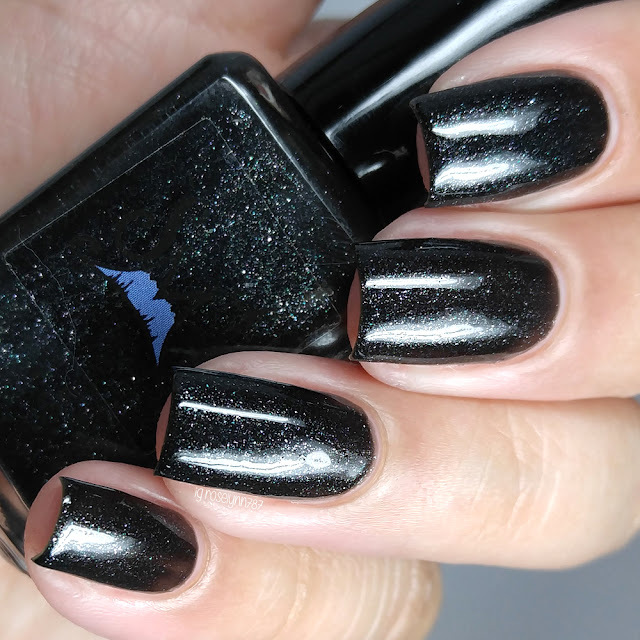 Doesn't the shimmer make this shade look like it's sparking stars in the night sky?! The shifting in colors (although subtle) also give this a really nice touch. The formula had a good consistency and opacity. However I did feel it was a bit on the thick side therefore it applied better with heavier layers as opposed to light-handed thin coats. Shown here in two coats and sealed with a glossy topcoat. Overall I'll admit I'm not usually a fan of shimmer heavy polishes, but there were quite a few in this collection that made me change my mind. Ring of Fire is hands down one of my top picks from this set and also for the Fall season. Although really all of these are nice in tone for the change of season. So you guys know my favorites, but tell me which one are yours? Will you be getting any of these for your collection? To recap, the Music City Collection by Smokey Mountain Lacquers will be releasing Sunday, September 18th at 8pm EST. Each full-size bottle retails between $8.49-$9.99 and mini-size bottles retail for $6. You can also purchase the full-size complete set for $49.90 or in a mini set for $32.40.